Designed to capture the true essence of Vietnam, this fascinating journey takes you from the bustling city of Saigon to the timeless capital of Hanoi. 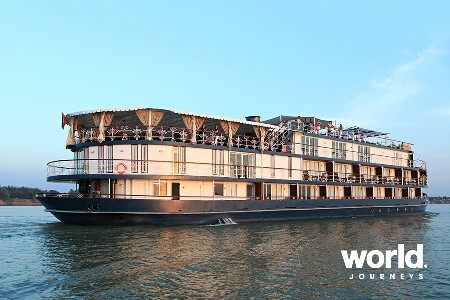 Along the way enjoy a Mekong river cruise to observe countryside scenery and river life. See Hoi An with its grand architecture and quaint riverside setting. 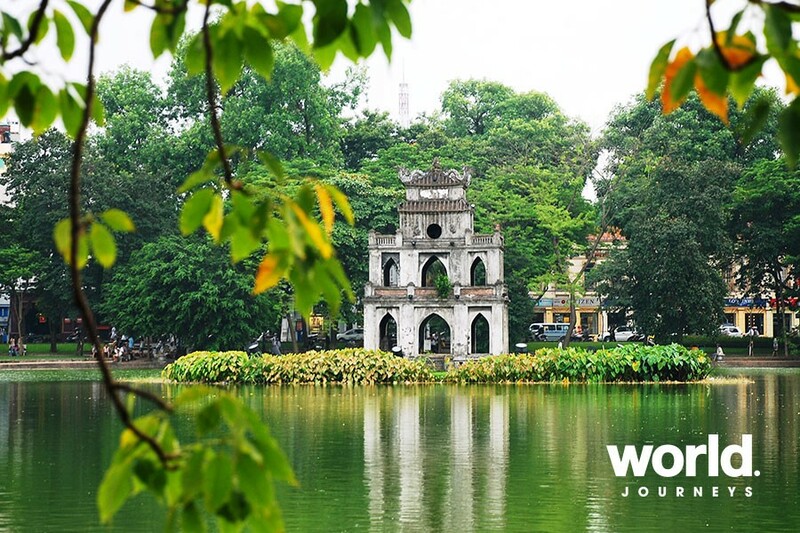 With ochre-coloured colonial buildings, tree-lined boulevards and scenic lakes, Hanoi is full of charm. Unique guided excursions provide insight into the country's architecture and traditional cultures and introduce you to the friendly local people and spectacular landscapes. Perfect for the first-time visitor, or those looking for an unforgettable experience in under ten days. Day 2: Saigon (B) Saigon is the country's commercial centre and, with over nine million inhabitants and five million motorbikes, a city that never sleeps. Despite the well-documented hustle and bustle, Saigon retains its connections with the past. 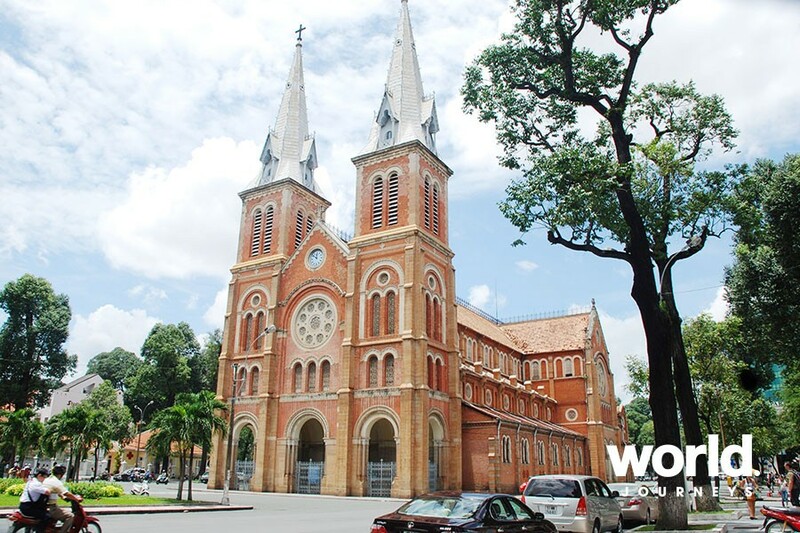 A walking tour to admire Saigon's historic landmarks is a must. Transfer to Dong Khoi Street, or Rue Catinat as it was known in the time of the French occupation, to discover some of the beautiful French colonial buildings built in the late 19th and early 20th century. Appreciate the splendidly restored exteriors of the Opera House and the former Hotel de Ville which are still two of the finest buildings in Saigon. Wander up to the Notre Dame Cathedral, a red brick edifice with twin spires based on the original construction from Paris (it is only possible to visit inside when no service is being performed). Then head across the square to the Central Post Office, designed by the French architect, Gustav Eiffel, before he had risen to fame for the Eiffel Tower. The former Presidential Palace, the headquarters of the Saigon Government during the American War, is a short drive away and reveals the history of Saigon during its turbulent recent past. Head out of the city centre on a short 6km drive to District 5 to visit Thien Hau temple, built by the Cantonese congregation in the early 19th century to honour the Goddess of the Sea. The temple's ornate interior courtyard is always full of life as worshippers from the local Chinese community come to offer their prayers. Take time to make a wish, write it on a small card and attach it to one of the incense coils in the local custom. Continue your visit to FITO (closed on Monday), the first museum of traditional medicine in Vietnam, offering an insight into how traditional medicine was used in the past. Return to your hotel. Day 3: Saigon > Cai Lay (Mekong Delta) > Saigon (B,L) Depart early in the morning from Saigon and head two hours to the southwest. Along the way notice lush rice paddies and fruit farms emerging alongside the highway. 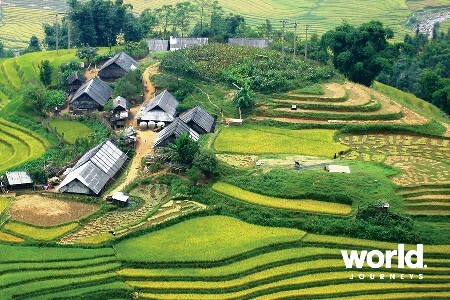 Upon arrival in Cai Lay, board a charming wooden boat to enjoy countryside scenery and river life. Then stretch your legs a bit and hop on a bicycle for a short ride of about 7km (over easy, level terrain) along narrow village lanes, past fruit orchards and local cottage industries. Locals will often greet you with a hello or "xin chao" as you pedal by. Arrive at the home of a tropical fruit farmer and have a walk around his orchard. Enjoy the opportunity to taste fresh fruit. Relax while enjoying the view from a small sampan boat as you are paddled slowly along tropical canals. 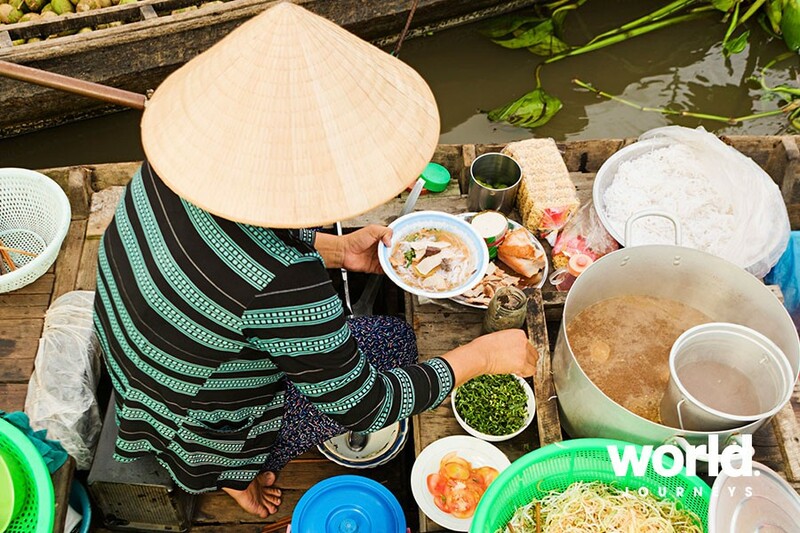 Disembark and walk through this Mekong village to a local home and enjoy a home-hosted lunch of Mekong Delta specialties. 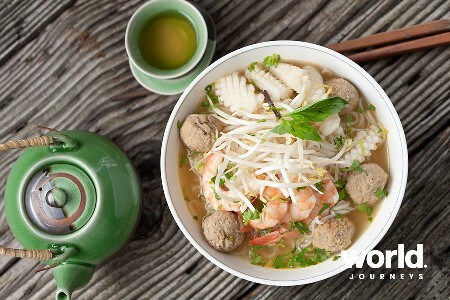 After lunch, a short walk takes you back to the car and your return trip to Saigon. 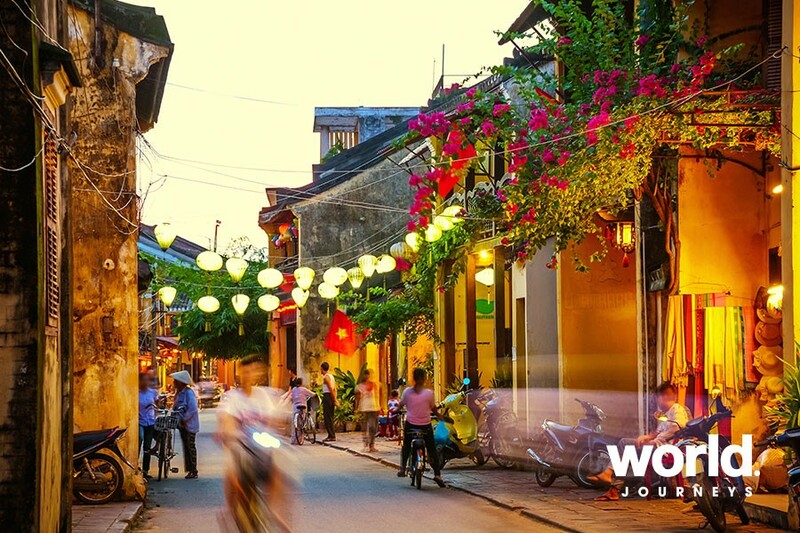 Between the 17th and 19th centuries, Hoi An was a prosperous trading port. Today, this World Heritage-listed ancient town boasts well-preserved buildings, pedestrian streets and unique cuisine, allowing visitors a glimpse of its illustrious past. The narrow lanes are ideal for a guided walking tour. There is plenty to visit including the old merchants' houses with influences from Chinese, Japanese and Vietnamese architecture; the 400-year-old Japanese Covered Bridge; the Assembly Hall of the Chaozhou Chinese Congregation with outstanding wood carvings; and the colourful market with stalls brimming with local specialties including silk, which can be tailored into fashionable garments within a day or two. Lanterns, simple yet colorful items, are now an essential part of Hoi An culture. Lanterns here are hand-made by local artisans and are meant to bring good fortune. A recent revival of the art has been led by an experienced artisan - Mr. Huynh Van Ba who is now in his 80's. Engage in a casual talk to him for a brief introduction to the history, shape, and color of the lanterns as well as the stages of production. Try creating your own lantern and take it home as a souvenir. 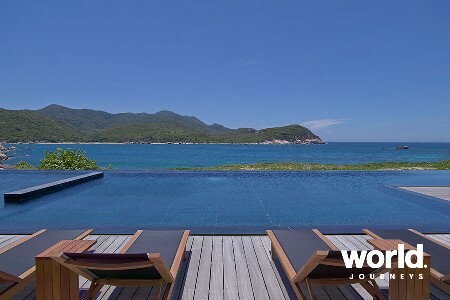 Days 5/6: Hoi An (B) Days at leisure to relax at the beach, or have some clothes tailored in Hoi An Town. Day 7: Hoi An > Danang > Hanoi (B) Transfer to the airport for your onward flight to Hanoi. (The regular check-out time for all hotels is 12.00 pm. Late check-out is not included). On arrival, you will be welcomed at the airport and transferred to your hotel. 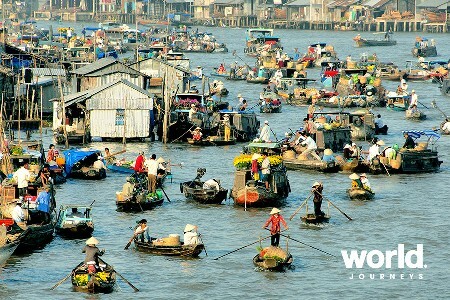 Day 8: Hanoi (B) With ochre-colored colonial buildings, tree-lined boulevards and scenic lakes, Hanoi is full of charm. Start the tour at the historic Ho Chi Minh Mausoleum, an imposing monument lavishly built using marble and granite, and where the preserved body of "Uncle Ho" resides. (Ho Chi Minh Mausoleum is closed every Monday & Friday, all afternoons and from late September until December). A short walk from the mausoleum is the lotus shaped One Pillar Pagoda - resting on a single stone pillar emerging from the water. Wind your way afterwards to the Temple of Literature, the first University for the sons of mandarins, for an overview about Hanoian culture and appreciation for ancient Vietnamese architecture. In the afternoon, visit the serene Museum of Ethnology, a 20 minute drive out of town that offers a fascinating insight into Vietnam's 54 ethnic minority groups (this museum is closed on Mondays). Drive back to central Hanoi for a walking tour through the Old Quarter to enjoy the bustling local life, then cap off the day with a show at the water puppet theatre - a uniquely northern Vietnamese art form depicting scenes of rural life and episodes of national history. Day 9: Hanoi > Halong Bay (B,L,D) This morning embark on a 3.5 hour drive to Halong Bay with a quick rest stop at Hong Ngoc Centre - the best place to stop and stretch your legs en route. On arrival in Halong Bay, board your deluxe junk, settle into your cabin and prepare your appetite for an enjoyable lunch on deck. Mid-afternoon you will visit the mysterious atmosphere of Tien Ong Cave, adorned with stalactites and stalagmites, then continue to the Cua Van fishing village, the largest community on the bay. This will allow a closer look into the lives of local fishermen before you transfer to a bamboo boat and are rowed slowly through the village with a museum and a school among the floating houses. Back to the boat, a cooking class is offered with the chef while your boat leisurely cruises. Or simply enjoy sunset cocktails and canapes on up top deck before being served a wonderful dinner on board. Day 10: Halong Bay > Hanoi Departure (B) Wake up early and partake in a Tai Chi class which is held on the upper deck. Visit Soi Sim Island, here you can relax in azure water of Halong Bay or enjoy over 200 steps to the up top for panoramic view of the whole bay. Return back to the boat and cruise towards the port while brunch is served. Prepare your luggage and hand your key to the reception for check out. Arrive at the jetty late morning and transfer back to Hanoi with light snack provided en route. Opt to visit a traditional pottery workshop en route. Transfer to the airport for your departure flight. Day 2: Hanoi (B) With ochre-colored colonial buildings, tree-lined boulevards and scenic lakes, Hanoi is full of charm. Start the tour at the historic Ho Chi Minh Mausoleum, an imposing monument lavishly built using marble and granite, and where the preserved body of "Uncle Ho" resides. (Ho Chi Minh Mausoleum is closed every Monday & Friday, all afternoons and from late September until December). A short walk from the mausoleum is the lotus shaped One Pillar Pagoda - resting on a single stone pillar emerging from the water. Wind your way afterwards to the Temple of Literature, the first University for the sons of mandarins, for an overview about Hanoian culture and appreciation for ancient Vietnamese architecture. Day 3: Hanoi > Halong Bay (B,L,D) This morning embark on a 3.5 hour drive to Halong Bay with a quick rest stop at Hong Ngoc Centre - the best place to stop and stretch your legs en route. 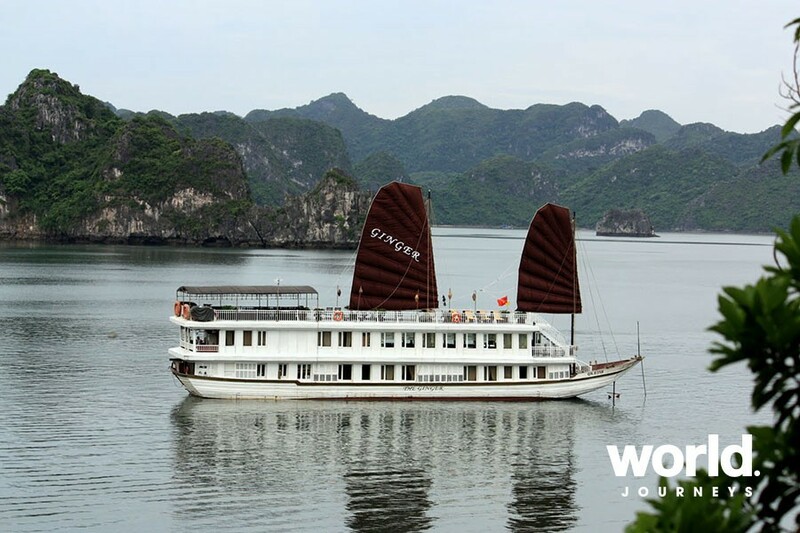 On arrival in Halong Bay, board your deluxe junk, settle into your cabin and prepare your appetite for an enjoyable lunch on deck. Mid-afternoon you will visit the mysterious atmosphere of Tien Ong Cave, adorned with stalactites and stalagmites, then continue to the Cua Van fishing village, the largest community on the bay. This will allow a closer look into the lives of local fishermen before you transfer to a bamboo boat and are rowed slowly through the village with a museum and a school among the floating houses. Day 4: Ha Long Bay > Hanoi > Danang > Hoi An (B) Wake up early and partake in a Tai Chi class which is held on the upper deck. 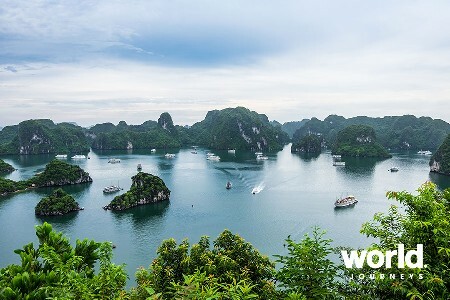 Visit Soi Sim Island, here you can relax in azure water of Halong Bay or enjoy over 200 steps to the up top for panoramic view of the whole bay. Return back to the boat and cruise towards the port while brunch is served. Prepare your luggage and hand your key to the reception for check out. Arrive at the jetty late morning and transfer back to Hanoi Airport. Day 5: Ho An (B) Between the 17th and 19th centuries, Hoi An was a prosperous trading port. Today, this World Heritage-listed ancient town boasts well-preserved buildings, pedestrian streets and unique cuisine, allowing visitors a glimpse of its illustrious past. The narrow lanes are ideal for a guided walking tour. There is plenty to visit including the old merchants' houses with influences from Chinese, Japanese and Vietnamese architecture; the 400-year-old Japanese Covered Bridge; the Assembly Hall of the Chaozhou Chinese Congregation with outstanding wood carvings; and the colourful market with stalls brimming with local specialties including silk, which can be tailored into fashionable garments within a day or two. Lanterns, simple yet colorful items, are now an essential part of Hoi An culture. Lanterns here are hand-made by local artisans and are meant to bring good fortune. A recent revival of the art has been led by an experienced artisan - Mr Huynh Van Ba who is now in his 80's. Engage in a casual talk to him for a brief introduction to the history, shape, and color of the lanterns as well as the stages of production. Try creating your own lantern and take it home as a souvenir. Day 6: Hoi An (B) Day at leisure to relax at the beach, or have some clothes tailored in Hoi An Town. Day 8: Ho Chi Minh City (B) Ho Chi Minh City is the country's commercial centre and, with over nine million inhabitants and five million motorbikes, a city that never sleeps. Despite the well-documented hustle and bustle, Saigon retains its connections with the past. 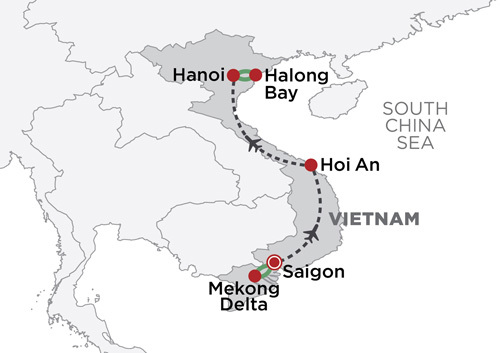 Day 9: Ho Chi Minh City > Cai Lay (Mekong Delta) > Ho Chi Minh City (B,L) Depart early in the morning from Saigon and head two hours to the southwest. Along the way notice lush rice paddies and fruit farms emerging alongside the highway. 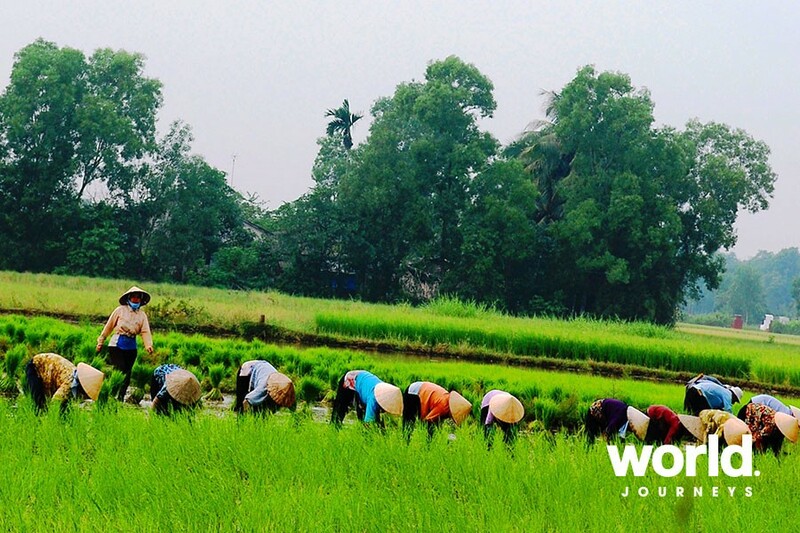 Upon arrival in Cai Lay, board a charming wooden boat to enjoy countryside scenery and river life. Then stretch your legs a bit and hop on a bicycle for a short ride of about 7km (over easy, level terrain) along narrow village lanes, past fruit orchards and local cottage industries. Locals will often greet you with a hello or "xin chao" as you pedal by. Arrive at the home of a tropical fruit farmer and have a walk around his orchard. Enjoy the opportunity to taste fresh fruit. Day 10: Ho Chi Minh City (B) Time at leisure until your transfer to the airport for your flight. (The regular check-out time for all hotels is 12.00 pm. Late check-out is not included). We had a fantastic holiday - Vietnam was everything that I had heard it to be and hoped it to be. The hotels were all top notch - particularly The Metropole. The Boutique Hoi An was fantastic - a beautiful white sand beach, great pool area, and wonderful newly renovated rooms that were very big - and it was only a 5 minute shuttle to Hoi An itself. The Caravelle was really nice too - though the rooms a little dated. Wonderful breakfasts though. The guides we had were brilliant - it would be hard to do without them. The Ho Chi Minh city tour and Mekong Delta tour were great. The Hoi An walking tour was a bit of a waste of time - we kind of only got taken to places that people are pushing stuff on you to buy, but the farm tour (which I thought would not be great) was so much fun, and a great surprise as it included a cooking class. The tour of Hanoi was also great. The trip to Halong and the overnight cruise I loved - my two daughters and husband enjoyed it but felt there should have been wifi on the boat we were on!!! First world problem!! But I guess its something that is now really important. It appears they state on their website that wifi is available. Vietnam Air was great. Our only issue was on the Vietjet flight - we should have stuck with Vietnam Air - our flight from Hoi An to Hanoi was cancelled - no notification - and we had a rather long wait at the airport for the next one. But all in all a fab time was had by all of us. Thanks for your help with organising our trip!